LAUGHING BEAR CABIN located in the Coosawattee River Resort just outside of Ellijay, Georgia is the perfect place to find your peace of mind. LAUGHING BEAR CABIN Pool table. Rustic. Relaxing. Pet Friendly. WiFi. Pool table. Rustic. Relaxing. Pet Friendly. WiFi. 20% OFF with 1 Week Stay! Equipped with Google Home. LUCY'S HEAVEN: Hot tub. Mountain View. Lots of space! Pet Friendly. WiFi. The owners of Laughing Bear Cabin have made sure that their cabin has everything you need to have a relaxing and stress free stay while you are our guests, and they have also put in several amenities to help you enjoy the outside which is what it is all about here in the North Georgia Mountains. Let's start by touring the outside of the dog friendly Laughing Bear (including the stroller which you can see in the pictures). 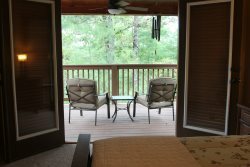 The outside is well maintained and has a wonderful firepit for enjoying the cool nights and making s'mores. The property is also accessed by paved roads inside the gated Coosawattee River Resort, and there is also a huge concrete parking pad. No getting stuck in the gravel or mud roads! There is also plenty of room for three to four cars if necessary. Inside you will find a well appointed living room with a propane fireplace set in a picturesque rock hearth. This sits alongside the 40 inch smart tv which sits next to the routers for the internet (of yes - this has house has wifi). The comfortable couches are new and are the perfect place to snuggle in for some good tube viewing. C'mon on in! Stretch out, kick off your shoes and watch the game or your favorite movie (oh, there is also a large collection of DVDs to choose from - just in case). The kitchen is spacious and has all the utensils, gadgets and appliances you will need to enjoy your home cooked meals. From coffee makers to pots and pans, you won't miss a thing! The kitchen adjoins the cute breakfast nook with a four seater table, and this room opens out onto the screen in deck. There is a quaint bathroom on the main floor and this is located next to the downstairs, beautifully decorated bedroom with a queen size bed (and wonderful linens and mattress). The room is well lit and has a good size fan to keep the air circulating. Additionally the room is full of windows to let in the natural light. The second bedroom is located upstairs and boasts a king size bed with "beary" nice decorative linens. The room also has lots of natural sunlight and being the master, the large bathroom is directly adjacent to the bedroom. Downstairs in the basement/garage you will find some really fun items including a pool table and another living room set for seating that includes a sofa, lounger seat and coffee table. This downstairs area is designed for hanging out, having fun and relaxing. If the weather is nice, well, just open the whole garage door and let the air in while you play pool! Does it get any better? The basement also has a full size washer and dryer should you need them. Great location. Easy drive, nice accommodations. Enjoy the screen covered porch or the front open porch. Plenty of deer to enjoy. We enjoyed our stay and look forward to coming back in May. Thank you for a great stay. Deep within a gated community through gravel roads there was a cabin perched on a small hill over looking the blue ridge mountains. Takes a little bit to get there but man it was worth it, the owners stay in constant contact and run through every detail via email, you walk in to a classic cabin feeling and just want to sit on the porch and admire the view on the 2nd floor balcony. My favorite parts were the comfortable mattresses, loads of cooking materials for a mountain meal, the hot tub that put all your muscles into relaxation, and the several more amenities. Theres a fire place, grill, fire pit, huge open first floor, plenty of room to sleep, huge table for eating, big fridge, and towns very close by for supply runs. Highly recommend if you love the mountains and dont love the huge prices other cabins cost. Cabin is nicer than in pictures. Very clean. Would come back again. This cabin had it all. It was clean, decorated cute for the holidays, and had everything we needed for a great weekend getaway. Instead of exploring downtown like we thought we would, we spent most of our time in the cabin taking in the wilderness and all the birds and deer that surrounded us, played pool in the basement, and grilling out. We loved all the thoughtful touches and it was incredibly clean for being pet friendly. The host was very responsive with helping us understand how to turn on the fireplace and with anything else we needed during our stay. My family loved waking up to feed the deer in then morning. We hope to have another weekend getaway sometime soon. Thanks for a great weekend! Great little cabin! Tons of deer! This Cabin is Equipped with Google Home, and this note from the owners explains how to use it. Enjoy! You can use the devices to play all venues of music. You can tell Google to play at certain levels, i.e. play at 40% volume. You can also utilize timers, weather reports, and alarms to wake you up in the morning. Google can also tell you jokes, and what happened on this day in history. The television is not hooked up to the Google app. There are over 1 million functions for this Google app. We set up the devices for anyone’s voice command. We hope this will bring your family a unique experience. Please let us know how it worked. We hope you enjoyed your stay at Laughing Bear. If you have any suggestions to make your experience better, please let us know."